"Your son was killed in action today. Despite intense enemy machine gun and rocket propelled grenade fire, your son fought like a lion. He remained in his fighting position until all his wounded comrades could be evacuated from the rooftop they were defending. It was during his courageous defense of his comrades that Aaron was hit by enemy fire.... With the exception of the Marines on Security, every man in the company attended the service. Aaron was respected and admired by every Marine in his company. His death brought tears to my eyes, tears that fell in front of my Marines. I am unashamed of that fact." Doug Zembiec, Major in the USMC, was known at the "Unapologetic Warrior". We featured him here as Someone You Should Know almost three years ago (must read). In fact, he was among the few that I included when I began that index - he is very "Mattis-like" or, maybe, General Mattis is very "Zembiec-like". 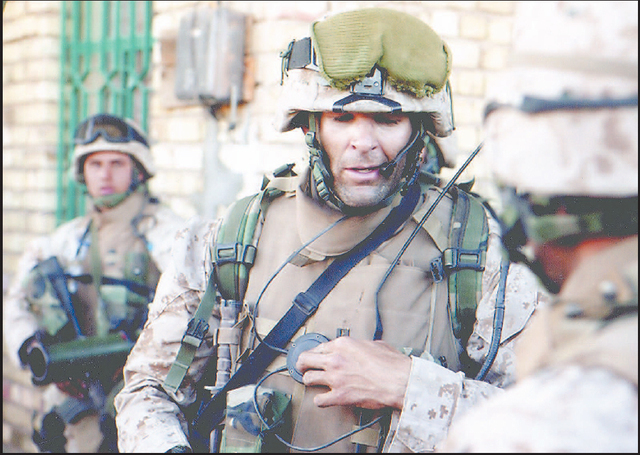 Just a few months before, then Captain, Zembiec led Echo Company into Fallujah. We caught that as part of the Showdown series about Fallujah (link here). Zembiec was leading his unit into combat where most of his men (53) had been wounded, with some wounded two or three times and still in the fight. He talks about his Navy Hospital Corpsmen that kept his men alive (link here). "On two occasions, Captain Zembiec coordinated the actions of the Marines from atop a tank while rocket-propelled grenades and enemy small arms fire impacted all around him. Wherever the battle raged with intensity, Zembiec could be found inspiring Marines to aggressively repel the enemy's determined assault..."
Right now, the Zembiecs are mourning a heavy, heavy loss. Doug's wife, Pam, and 1-year old daughter, Fallyn Justice, are with family members now. I'll post more information as it comes in. I've struggled with how much to share at this point. I'll let you know if we can help in some small way. One thing for certain, Doug Zembiec would want you to celebrate his life, his time with his family and his time on this Earth as a Marine. Tuesday 05/15/2007 - wake at Taylor Funeral Home in Annapolis, MD. Two sessions 1400-1600 and 1800-2000. Wednesday 05/16/2007 - funeral service at the UMA-Annapolis Chapel 0900-1100 followed by a procession to Arlington National Cemetary for burial. The Patriot Guard/Armed Forces Motorcyle Club will lead the procession to take Douglas home. Update 05-14-07: More amazing tributes here from his men. Update 05-17-07: The LA Times and Washington Post articles about Doug's burial.